Well actually, twice, if you count the moderator. With all the griping that the Republicans and their thinks tanks have been doing about Social Security, one would have expected to hear someone say something on the subject ... anything at all. Maybe it is better to remain silent and be thought a fool, rather than to speak and remove all doubt. "Today the national debt is at record highs and growing unsustainably. Interest will be the fastest-growing part of the federal budget, tripling over the next 10 years. Social Security, the lifeline of millions of American seniors, is rushing toward insolvency. With all of the tax plans presented tonight, estimated to cost anywhere between $2 trillion and $12 trillion over a decade, what specific steps will you take to balance the budget?" The Democrat's last debate on October 13th wasn't much better. They only spent two minutes discussing the subject of Social Security. That's odd, considering that last year 24% of the federal budget was spent on Social Security, but less that 2% of the last Democratic debate was spent on this subject. And only two candidates spoke on the issue — Hillary Clinton and Bernie Sanders. Then Anderson Cooper interrupted and changed the subject to immigration. (See the short video below). Since the dawn of mankind (actually, since FDR's New Deal) the Republicans have always been against Social Security. And today's "moderate" Democrats (Third Way Centrists) have shown a willingness to "compromise" with Republicans on cuts to Social Security. Not too long ago, many "moderate" Democrats (like Obama) were saying we would be able to reduce Social Security cost-of-living adjustments (COLAs) by using chained-CPI, which rises more slowly than regular CPI. That's because, it accounts for the way our elderly and poor switches to pet food when the price of "people food" rises — like switching from steak to chicken — until chicken costs too much, and then switching to "people" tuna, before eventually switching to "cat" tuna. Progressive senators such as Elizabeth Warren and Bernie Sanders were always against using chained-CPI for Social Security. Bernie Sanders said it would be immoral. Elizabeth Warren was shocked that Obama would even consider it. But would a self-proclaimed "moderate" like Hillary Clinton (as President) pass Republican-sponsored legislation to use chained-CPI in the next budget deal? ABOUT COLAS: The Bureau of Labor Statistics: The “CPI for All Urban Consumers” (CPI-U) represents the spending habits of about 80 percent of the population of the United States. The “CPI for Urban Wage Earners and Clerical Workers” (CPI-W) is a subset of the CPI-U population, and represents about 32 percent of the total U.S. population. In addition to the official CPI's for the CPI-U and CPI-W populations, the CPI calculates an experimental price index for Americans 62 years of age or older. The Bureau of Labor Statistics also plans the periodic release of updated estimates of the “Experimental Price Index for the Elderly” (CPI-E). Read how the CPI-E compares to other measures of inflation. Also, from the Washington Post: Meet CPI-E, the progressive alternative to chained CPI. Whereas, chained-CPI" is an alternative measurement for the “Consumer Price Index” (CPI) that considers product substitutions made by consumers and other changes in their spending habits. The chain-weighted CPI is therefore considered to be a more accurate inflation gauge, rather than the traditional fixed-weighted CPI — because rather than merely measuring periodic changes in the price of a fixed basket of goods, it accounts for the fact that consumers’ purchasing decisions change along with changes in prices. Both Elizabeth Warren and Bernie Sanders also have rock solid plans to expand Social Security with sensible and fair ways to preserve and pay for it. Hillary on the other hand (as a "centrist" Democrat), wants to keep things just as they are — and only obliquely mentions increasing benefits for widowed and single women, but without ever saying exactly "how" she could achieve this. That's because Hillary has never had any real plan; but Senators Elizabeth Warren and Bernie Sanders do. Although Federal and State government workers are getting increases in their wages (COLAs) next year, Social Security recipients, federal retirees and veterans are not. Elizabeth Warren recently introduced legislation to give seniors an emergency boost with a new bill that would end taxpayer subsidies for CEO retirement plans and give the money to seniors. It's called the Seniors and Veterans Emergency (SAVE) Benefits Act (a one-time payment equivalent to a Social Security benefits increase of 3.9%). Social Security recipients aren’t getting a cost-of-living adjustment because there was actually a 0.4 percent decrease in the government’s calculation of the cost of living from the third quarter of 2014 to the third quarter of 2015. The government uses a formula called the Consumer Price Index for Urban Wage Earners and Clerical Workers (CPI-W) to calculate Social Security benefits, and that index revealed a slight decrease in the cost of living, primarily because gasoline prices fell sharply in the past year. A drop in gasoline prices largely benefits younger Americans, while seniors, who already pay twice the medical costs as the average American, saw inflation in healthcare prices along with traditional outlays like food and housing. In other words, an elderly grandmother who no longer drives but has seen her prescription prices go up is effectively being told by the government her benefit check won’t get a cost-of-living bump because gasoline is cheaper. Many economists and advocates have called on the government to use a different price index for Social Security benefits that more accurately measures the cost of living for elderly Americans — the Bureau of Labor Statistics actually already tabulates this, called the CPI-E. In the meantime, Senator Elizabeth Warren and 16 Democratic colleagues have stepped into the breach proposed a bill on Thursday that would provide seniors with a one-time emergency payment of 3.9 percent of annual benefits, which would average out to a $581 payment. The Senators estimate that amount could cover up to a year of out-of-pocket pharmaceutical costs for seniors that have largely fallen victim to odd government accounting quirks. Why 3.9 percent? It’s not tied to any price index, but rather is the exact amount that CEO compensation at the top 350 US firms increased last year. The top 100 CEOs have a combined $4.9 billion saved for retirement, which equals the cumulative retirement savings of 116 million Americans ... Those CEO retirement accounts are explicitly subsidized by US taxpayers; the government provides CEOs with special tax-deferred retirement options and unlimited corporate deductions for executive “performance pay.” Almost half of the retirement assets held by Fortune 500 executives are in these tax-deferred plans, which are not available to most of the executive’s employees. Hillary also doesn't distinguish herself when she says she opposes the Republican's efforts to raise the retirement age — because Bernie Sanders and most Democrats are also against raising the retirement age. "The poverty rate for widowed women 65 or older is nearly 90 percent higher than for other seniors—in part because when a spouse dies, families can face a steep benefit cut. For a two-earner couple, those benefit cuts can be as much as 50 percent. Hillary believes that we have to change that by reducing how much Social Security benefits drop when a spouse dies, so that the loss of a spouse doesn’t mean financial hardship or falling into poverty." TIME: The "file and suspend" strategy calls for the higher-earning spouse to file for Social Security benefits at his or her full retirement age, but then suspend that filing while the benefit grows, until as late as 70. The lower-earning spouse can then claim spousal benefits at his or her own full retirement age, and later shift to their own full benefit, if it is larger. (A spousal benefit is half of the primary earner’s benefit.) The Center for Retirement Research has estimated that file-and-suspend adds $9.5 billion in annual benefit costs to the program. The White House targeted it for elimination in the budget plan issued last year, calling it an “aggressive” move used by high-income households to “manipulate” benefits. The budget deal approved by the House this week would clamp down on the practice for anyone who turns age 62 after calendar year 2015. Angry Bear: "File and suspend" allows someone to get Social Security benefits prior to retiring, while not having to accept the lower benefits one gets if one retires at 62 or 66. One can get the higher benefits later. This will now not be allowed, so one must accept the lower benefits if one starts getting benefits early. This has only been possible for married couples with this involving one getting spousal benefits and then their own through some semi-complicated maneuvers that have been allowed since 2001." On Hillary Clinton's website, she says she wants to "expand Social Security for those who need it most" — meaning, mostly for women, who over the course of their lifetime, earn less (on average) than men do — and so therefore, they usually receive a lower Social Security benefit amount. This is a very noble idea, but then again, Hillary Clinton doesn't explain how she could raise their benefit without also increasing taxes on what she defines as "the middle-class". Senators Elizabeth Warren and Bernie Sanders are "gender-neutral", and want to expand Social Security for EVERYONE. 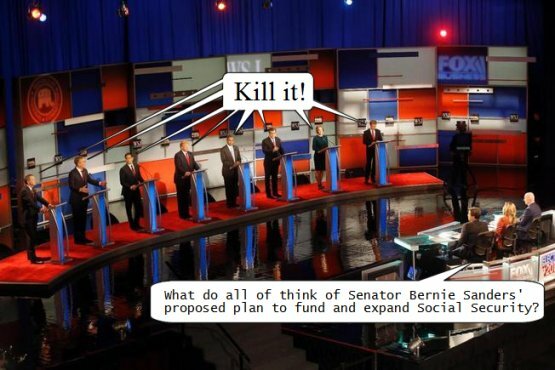 At the last debate, Hillary Clinton hesitated on expanding Social Security; whereas Bernie Sanders, by contrast, has introduced a bill that would expand Social Security across the board and increase its solvency by lifting the cap on earnings subject to Social Security payroll taxes. Hillary's website also says she opposes closing the "long-term shortfall" of Social Security funding on the backs of the middle class, whether through benefit cuts or tax increases. It should be noted that stagnant wages over the past 40 years has greatly contributed to the long-term funding of the Social Security trust fund (Via Dean Baker at the Center for Economic Policy Research per the 2015 Social Security trustees report). Hillary says she wants to preserve the Social Security trust funds by asking the wealthiest to contribute more, including options to tax some of their income above the current Social Security cap, and taxing some of their income not currently taken into account by the Social Security system. She isn't very specific, but maybe she was indicating that she might be open to taxing capital gains, such as income earned from stock investments, which is currently exempt. But that would literally take an act of Congress to achieve, because an executive order wouldn't pass constitutional mustard. But to be fair, any proposal to raise taxes or alter Social Security's funding and distribution would require a majority in Congress, not just a sitting president (whether it's a Democrat or a Republican). Currently both chambers of Congress (the House and the Senate) are dominated by Republicans. Electing a Democrat in 2016 (at best) could only maintain the status quo, (if they don't "compromise with the Republicans), unless of course, there were enough votes to override a presidential veto. And for added contrast, here is where else Senator Bernie Sanders and Hillary might disagree, because unlike Hillary, Bernie doesn't define people making $250,000 a year as "middle-class" — because people who earn that much are in the top 1%. On the issues (from Bernie Sanders' website) he has introduced legislation to lift the $118,500 cap on Social Security taxes [those in the top 5%] so that everyone who makes over $250,000 a year pays the same percentage of their income into Social Security as the middle class and working families — which is everyone who $118,500 or less, because they pay this tax on 100% of their earnings; whereas members of Congress (who earn $174,000 a year), do not. BASH: Is that something that you would support? And if not, why not? CLINTON: I want to enhance the benefits for the poorest recipients of Social Security. We have a lot of women on Social Security, particularly widowed and single women who didn’t make a lot of money during their careers, and they are impoverished, and they need more help from the Social Security system. And I will focus — I will focus on helping those people who need it the most. And of course I’m going to defend Social Security. I’m going to look for ways to try to make sure it’s solvent into the future. And we also need to talk about health care at some time, because we agree on the goals, we just disagree on the means. SANDERS: When the Republicans in the Congress and some Democrats were talking about cutting Social Security and benefits for disabled veterans, for the so-called chained-CPI, I founded a caucus called the Defending Social Security Caucus. My view is that when you have millions of seniors in this country trying to get by — and I don’t know how they do on $11,000, $12,000, $13,000 a year — you don’t cut Social Security, you expand it. And the way you expand it is by lifting the cap on taxable incomes so that you do away with the absurdity of a millionaire paying the same amount into the system as somebody making $118,000. You do that, Social Security is solvent until 2061 and you can expand benefits. (Below) This would have mostly likely been the Republican candidates' response — had they been asked. P.S. Please sign this petition and this petition to support Senator Elizabeth Warren's plan to increase benefits for our seniors. Thank You. is obscene. What they should be talking about is reducing medical costs, modeled on every other industrialized nation. America is being robbed blind with overpriced drugs, equipment and "other services", yet it barely gets a mention. since, had you not posted it, I may not have found your excellent blog. I'm still researching the so-called 'reform' (contained in the recently signed budget deal) which would flatten SSDI beneficiaries' monthly stipends. The topic seems to have fallen into some kind of void, outside of the few articles which you've referenced. I'm wondering if the PtB attempted to put the quietus on the topic in the MSM. Dunno. But, it won't stop me from searching for more info. below, at least from Minute 00:38 through 00:54. Sometime next week, I plan to make a video clip from a 20-minute C-Span interview about the recent (supposed) SSDI program overhaul, and the new flattened monthly stipend to be tied to the FPL. Following that interview with a Hill reporter, a Republican lawmaker, Rep Tom Cole (House Budget and Appropriations Committees), confirmed that this reform was part of the Budget Deal. When asked by the C-Span host, he even confirmed that this cut would apply to all SSDI recipients, not just future beneficiaries. That's 'why' I've continued to search for more details. I'll go over to "The Hill," and maybe to C-Span, to see if there have been any retractions. I'll probably poke around for a little bit longer, just to make sure that this "change" isn't simply hidden in archaic language (although I agree with you that it doesn't appear to be part of the bill). BTW, I'm pretty much a commenter, and shy away from writing formal posts. Thank you for allowing me to join your blogging community. I expect to learn a great deal from reading and blogging here. The L.A. Times wrote: "The flat benefit didn't make it into the final bill. Curiously, however, the savings it was expected to provide was still being cited by some Republicans as a point in favor of the deal." FYI: The owner of this website is Robert Oak. Just like you, I'm a visitor too ;) Maybe you should write a post for the Instapopulist once you have another update. Thanks again. Wow! Thanks for all the information and links. May have further comment after I've had a chance to peruse all these resources. Hiltzik is one of my favorite writers. I should have thought to have gone to his column to see what he had to say about the proposed SSDI overhaul/restructuring. Duh! I have to wonder if the C-Span interviews could have been a factor in the decision to pull this reform proposal. The viewer phone calls in both segments included many outraged SSDI beneficiaries. Now, I'll need to make a correction to a couple of comments that I've made based upon the reporting of The Hill and C-Span's Washington Journal. A 'Stupid' Question: How does one access their account? I was considering adding a little 'profile' info, but I can't figure out how to go in to make the change/addition. Just click on your name! Just click on your name to edit your profile. The California Public Employees’ Retirement System (CalPERS) said it paid $3.4 billion in performance fees to its private equity managers since 1990 while the controversial sector generated $24.2 billion in profits for retirees.